Having posted the 1950's Cabot the other day, it reminded me that I haven't talked about the earlier version of the Cabot yet. 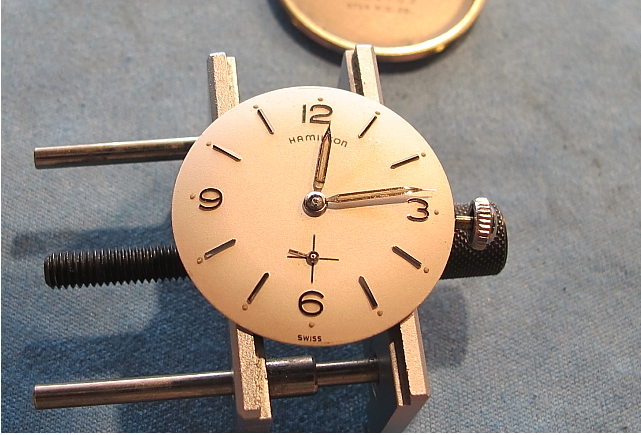 Released in 1935 with the debut of the "new" 14/0 sized movements, the original Cabot was produced for four years. 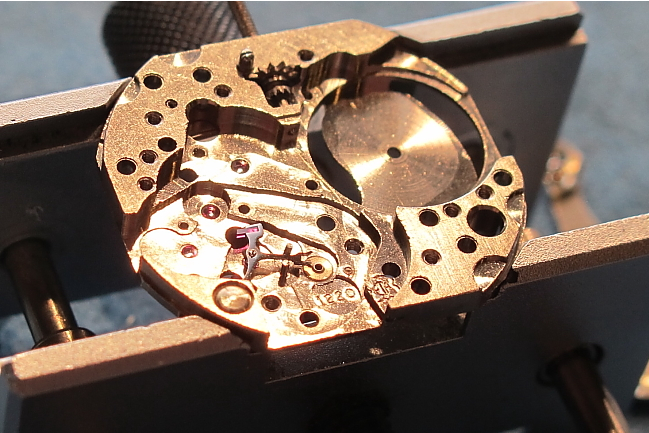 In the earliest years of the 14/0 movement, the solid gold models got the 19 jewel 982 movement and the gold filled models got the 17 jewel 980. 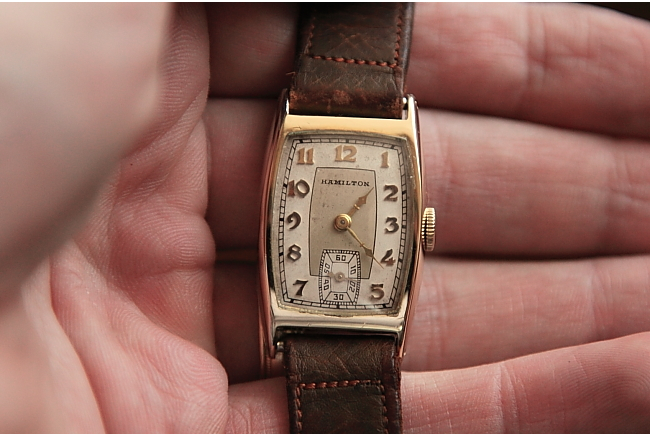 Since the Cabot is in a 14K gold filled case, you're most likely to find a 980 behind the dial. 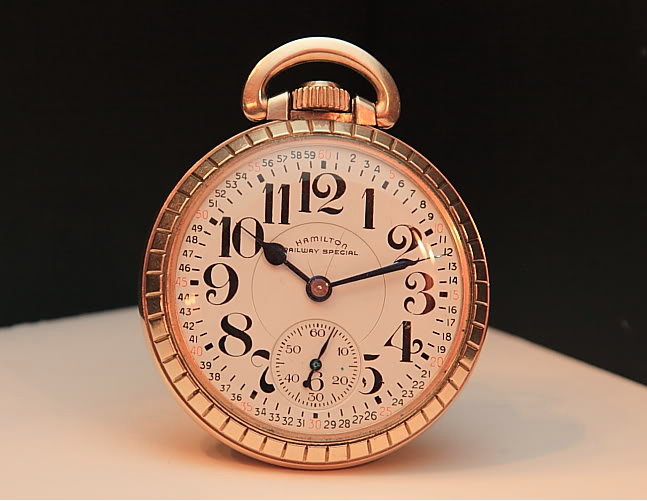 Once the 982M (medallion movement) was introduced (in 1940 I think) the 982 went into gold filled cases too, depending on the model. Like other models from this period, the Cabot came with either an applied gold numeral dial with solid gold numerals or a black enamel dial. The latter is less common, but still relatively easy to find. I wonder if the Cabot was the inspiration for the Boulton? The Boulton was released in 1940 and a modern version is still being made today! The Cabot is a nice looking watch, in my opinion, and I definitely like the look of the enamel dial - which was not available with the Boulton. 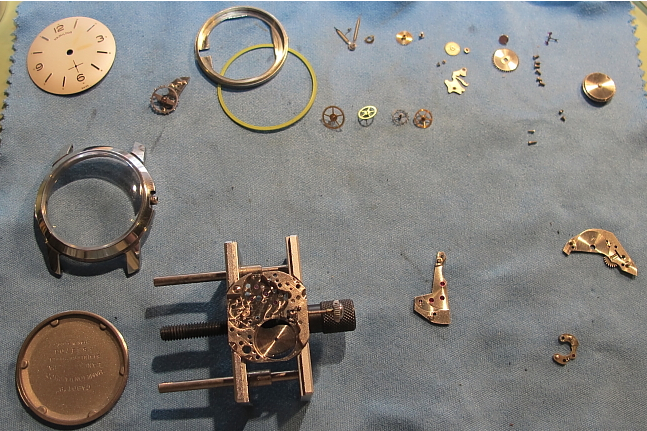 Here's a before and after of an AGN dialed Cabot to show you what a difference just cleaning the dial can make. I think it's funny how what was originally dark became light and vice versa. These two toned butler / white finished dials are very striking. 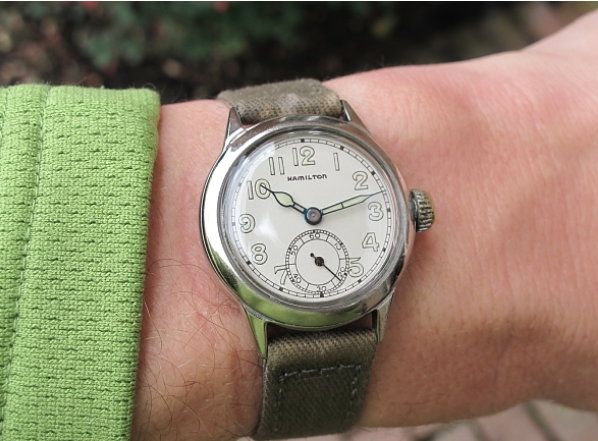 Here's a wrist shot of my enamel dialed Cabot. The style of hands is called "solid diamond" and I think they really look great. 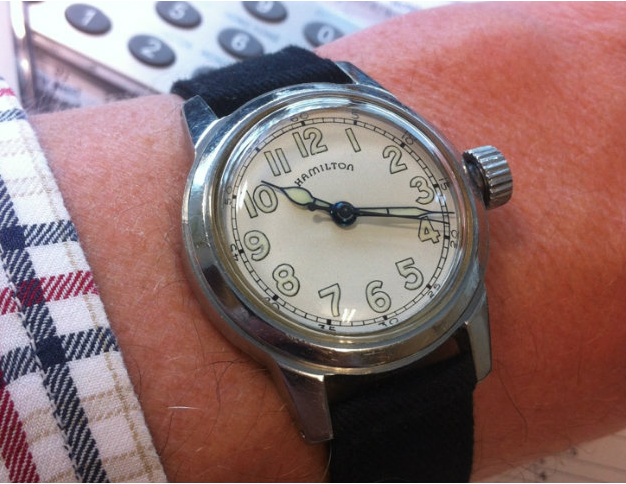 I recently picked up a Hamilton Haddon as a project watch. I had a Haddon a long time ago and sold it. But I'm a sucker for an old Hamilton in need of tender loving care, so I bought another one. 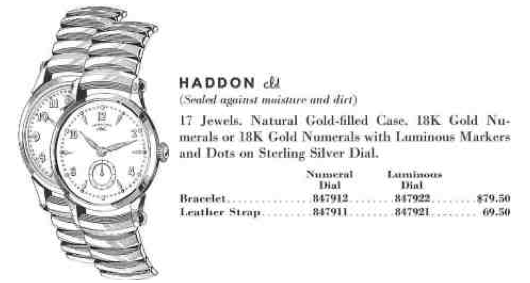 The Haddon CLD was part of the second generation of CLD (sealed) watches. It's quite a bit larger than the first generation Langdon - which is the closest comparison. 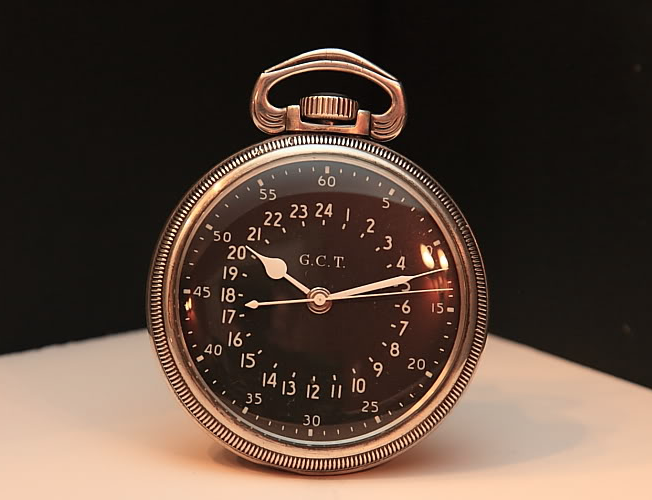 It was produced for only two years and two different dial arrangements were available; either a AGN dial or a luminous marker dial. The Haddon has a two piece case with a pop-off front bezel and a case back with integrated lugs. 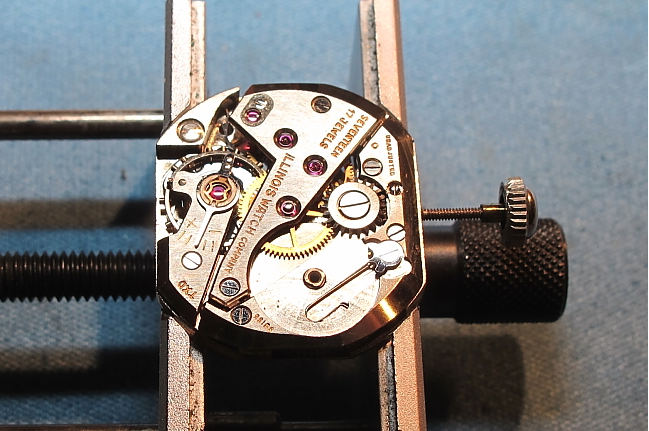 Like most CLD models, the Haddon's 8/0 sized 747 movement is held in the case back and is pulled out the front when the bezel is popped off. 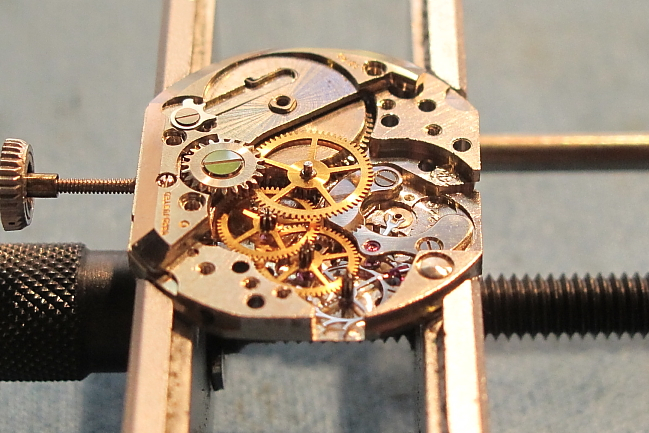 It uses a two-piece stem, since there's no access to the back of the movement while it's in the case. I have found that many of these 2nd generation CLD's typically wear okay and any wear through you're likely to find will be on the reverse, near the crown. I don't know why that is but I bet it occurs at least half the time. As received, my Haddon was in typical shape. It was quite dirty but nothing a thorough cleaning wouldn't take care of. I'm not sure if the bracelet on it is original to the watch. It could be or maybe it's just a very close likeness. I usually put straps on my watches but I kind of like the way this one looks with it's bracelet... original or not. It's interesting how Hamilton liked to name men's (and women's) watches with given names likes Foster, Rodney, etc. and although some common names were never used (example - David), other less common names were used more than once. Sometimes the same name was used three times! One example of a repeat model name is the Cabot. The first Cabot was introduced in 1935. A second Cabot was introduced in 1956 and made for three years. 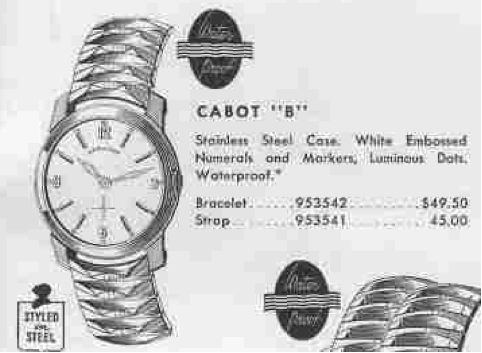 In 1956 it was called the Cabot B but in the latter two years it was just the Cabot. 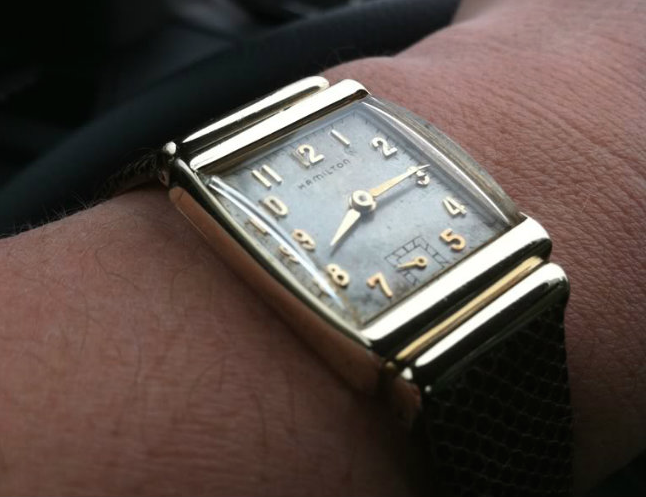 The Cabot B is a medium sized watch and a good size for a vintage watch. It's a classic 1950's flying saucer design in my opinion with a simple, clear dial in a stainless steel, "waterproof" case (assuming the gaskets are in good shape). 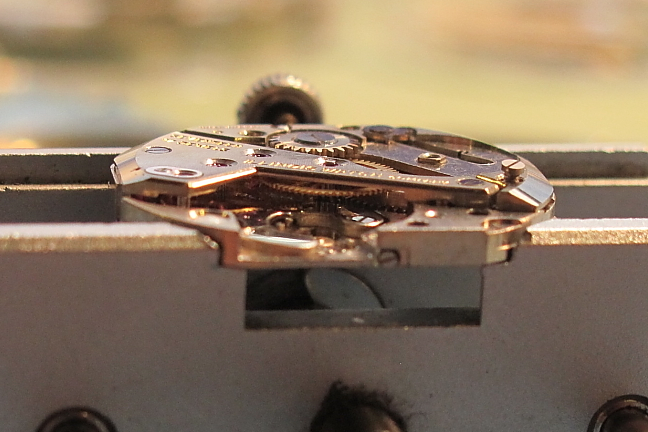 Sometimes a B was added to a watch model when the movement was changed from it's original design. 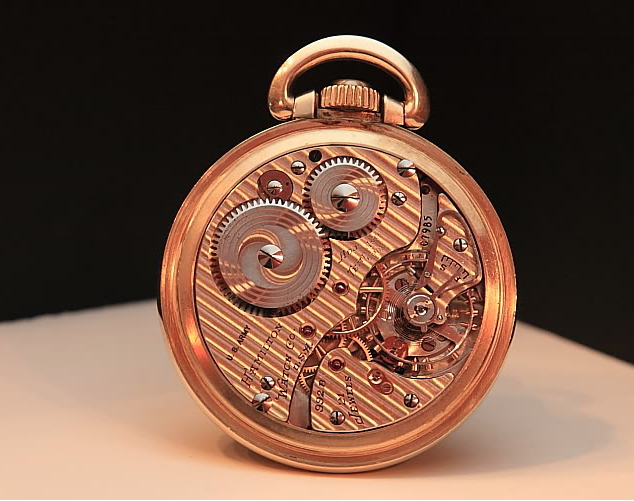 For example, the Boulton was first produced with a 19 jewel 982 movement and when the 982 was replaced by the 19 jewel 753 movement, the watch was renamed the Boulton B. However, the Cabot B is a little bit of an oddity - as it was introduced as a B model but then dropped it after the first year and was just called the Cabot. I recently had an opportunity to service a Cabot B and thought I'd show you how it went. This is a pretty detailed step by step explanation so you can get a feel for what's involved. As received, the watch was in decent shape overall. It looked a little noisy on my timer and it's owner said it stopped occasionally so it was time to be serviced. Like your car, mechanical watches need to be serviced every few year to make sure the parts are clean and properly lubricated. 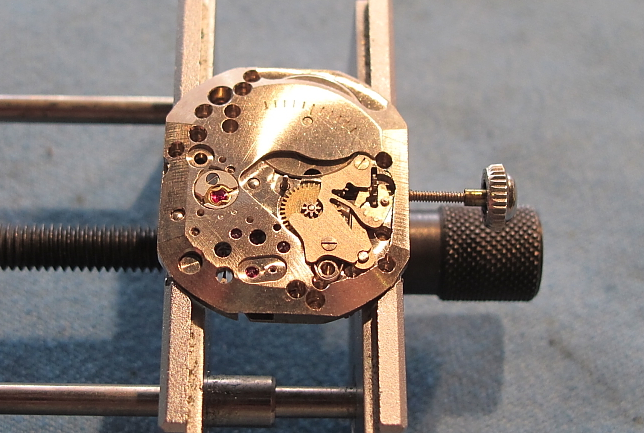 This watch opens through the back - which I was happy to see, as often these "Swiss" Hamiltons open through the crystal and have a split, two-piece stem that can be a challenge to separate. With the back opened up, everything looks good - including the gasket (green). The one thing I was really surprised by though was the presence of an Illinois movement inside. I was expecting a Swiss made 673 movement. So, I bet the Cabot B has an Illinois movement and the Cabot in 57 and 58 has a 673 - but that's a total guess on my part. 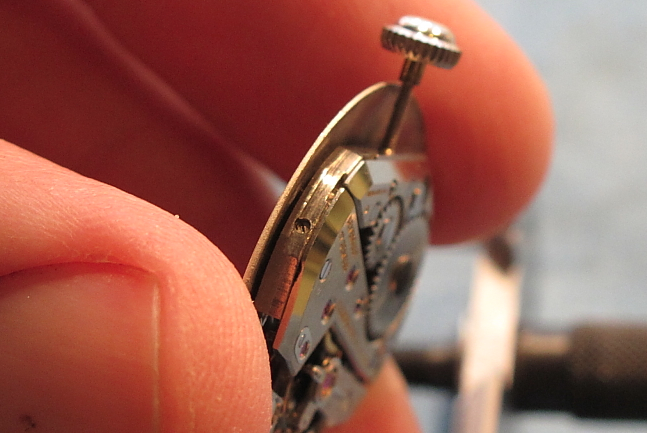 To get the movement out all you need to do is loosen the little screw just below where the stem enters the movement. You can see it on the left side of the watch movement in the picture below. A couple of turns loosens the screw. Then you pull out the stem. 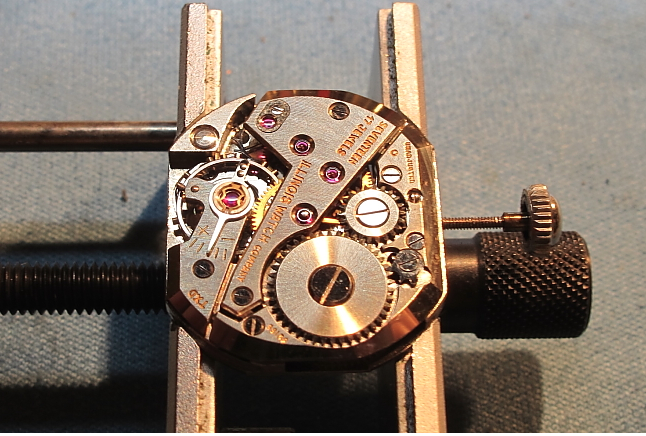 Once the stem is out, the movement will come right out when you flip the case over. Once the movement is out of the case, I put the stem back in. Then the next thing to do is to remove the hands and pull the dial. 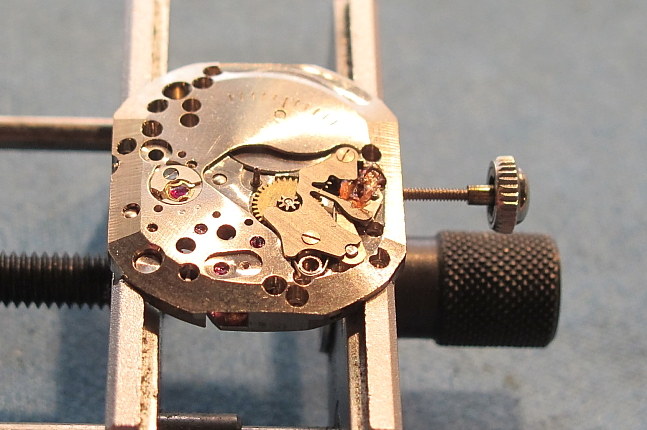 To get the dial off, you loosen two dial feet screws on the side of the movement. Here's a picture of one. The other took me a while to find - it's a smaller screw and on the side opposite the stem, near the balance bridge. 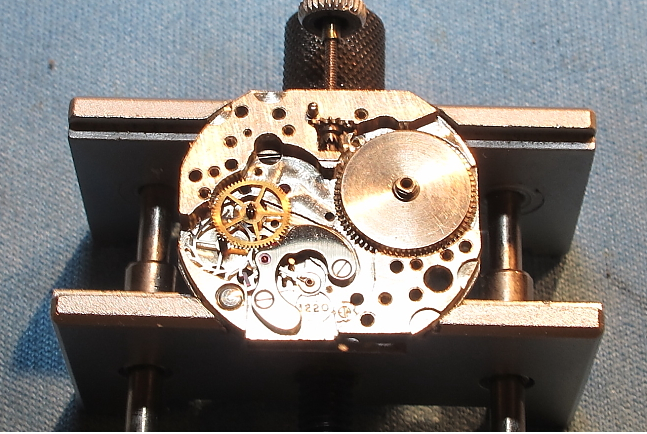 With the dial removed, the hour wheel (center below) and the cannon pinion (inside the hour wheel) need to be removed. The hour wheel and cannon pinion hold the hour hand and minute hand, respectively. If you compare the picture above with the picture below, you might be able to see how the hands operate together. The cannon pinion is a slip fit over the center wheel shaft in the center of the case. As the shaft turns, it also turns the cannon pinion. The cannon pinion has teeth to engage the golden minute wheel visible below. The minute wheel teeth on the outer diameter engage the cannon pinion and a separate set of teeth, on a smaller diameter, engage the teeth on the hour wheel (see above). So, as the cannon pinion turns the minute wheel, the minute wheel turns the hour wheel. 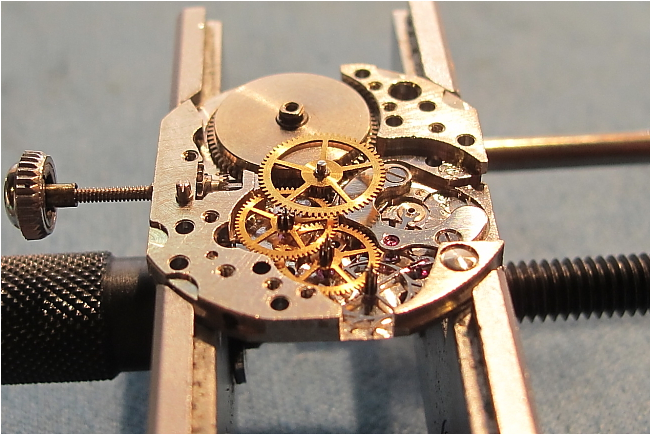 With the parts removed from the front, the movement is flipped over and the mainspring tension is let off. This is an important step and must be done or you'll risk damaging the internal parts when you disassemble it. The mainspring is underneath the larger winding wheel with the large-headed screw in the center. Just to the right of the winding wheel is the "click". If you hold the click open while you turn the crown & stem, you can let the spring gently unwind. 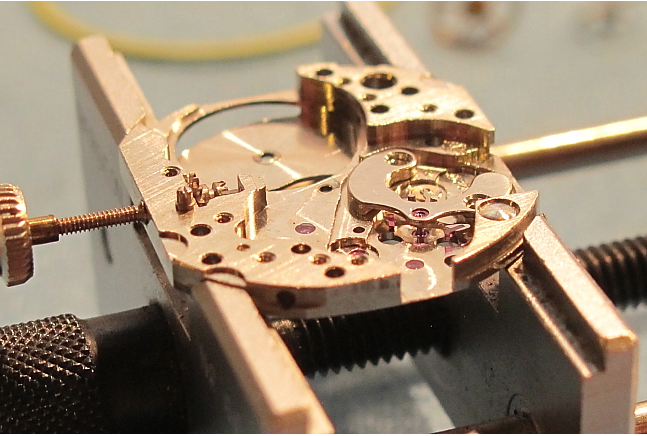 With the mainspring let out, the mainspring winding wheel can be removed. You can see the J-shaped spring that holds the click. It looks like a fish hook in this shot. It's the click you hear when you wind a watch... "click, click, click, click". Next, all the screws holding the mainspring bridge and the train bridge can be removed in order to get to the wheels inside. With the bridges removed, you can see the center wheel and third wheel have been removed (upper right in picture below). The fourth wheel and the escape wheel remain, along with the balance. It's easier to remove the last two wheels once the balance is taken off. Just one screw is holding it on. Now the balance is removed and it exposed the pallet fork and the bridge that holds it in place. 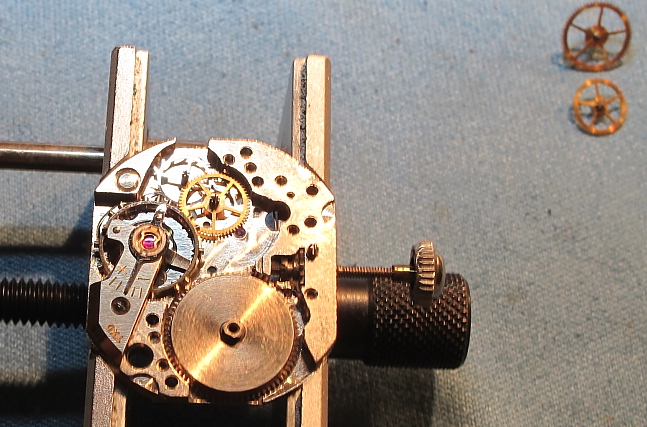 At this point you can also see this Illinois movement is made by ETA and is a 1220 movement. The markings were under the balance. In this shot the main plate is fully naked and ready to go into the cleaner. 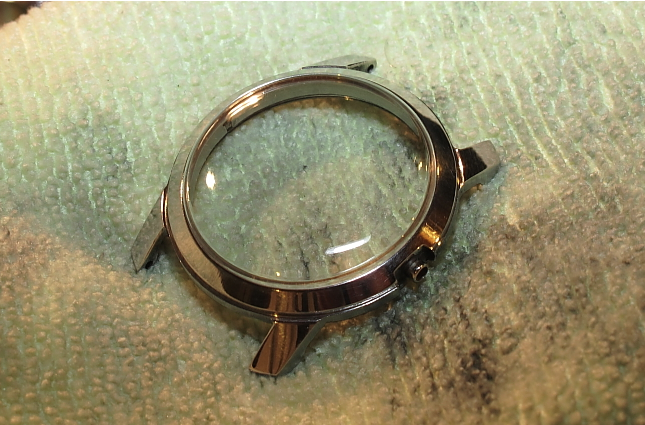 While the ultrasonic works it's magic, I'm able to give the case a little attention... polishing the crystal and bezel. The dial shows what are called "radium burns" from the luminous material on the hands. 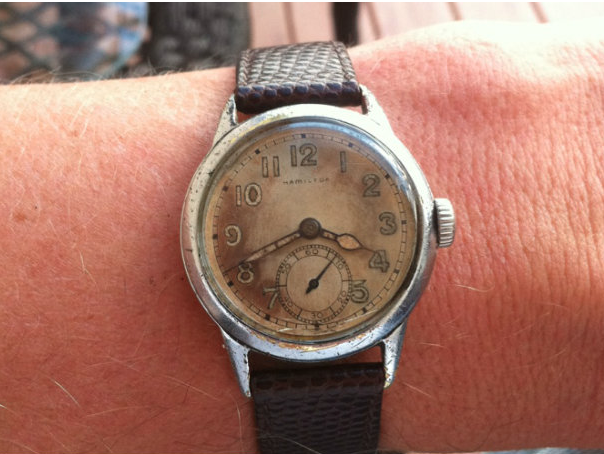 The watch probably sat for years at 3:07 and the dial was left with burn marks to prove it. They're pretty much on there for good. I will try to clean them off but usually they're not easily removed. Here's a shot of everything cleaned and ready to go back together. Here's the pallet fork getting ready to go back in. In this shot you can see the ETA logo and 1220 more clearly. A bridge holds the pallet fork arbor in place. You need to be very careful to get both pivots lined up before tightening any screws. This movement is tricky to re-assemble. It has four wheels all on a single bridge and getting them each lined up will drive you crazy if you don't have a lot of patience. The mainspring barrel needs to go it at this point too. I put the mainspring bridge back on to help guide the placement of the train bridge. In the shot below, you can imagine what a pain getting all four wheels to line up might be. They're lined up okay now but this is the angle from which you look at the wheels and poke around with tweezers until they get into place. Sometimes you need a stiff drink of single malt when you're finished. Now all the screws go back in as well as the mainspring winding wheel and it's screw. 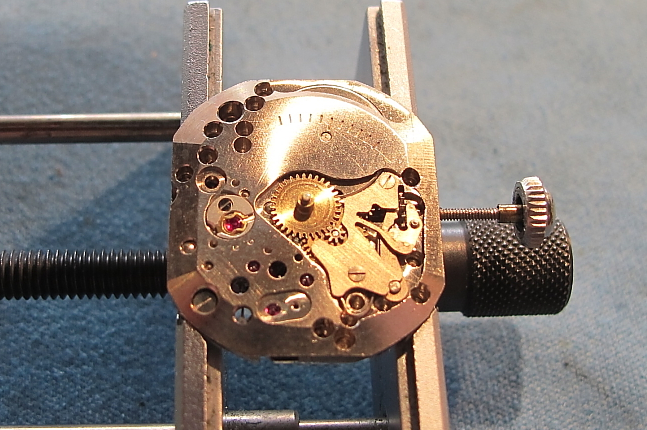 On the front, the keyless works (to wind the watch and set the time) are re-installed and lubricated. 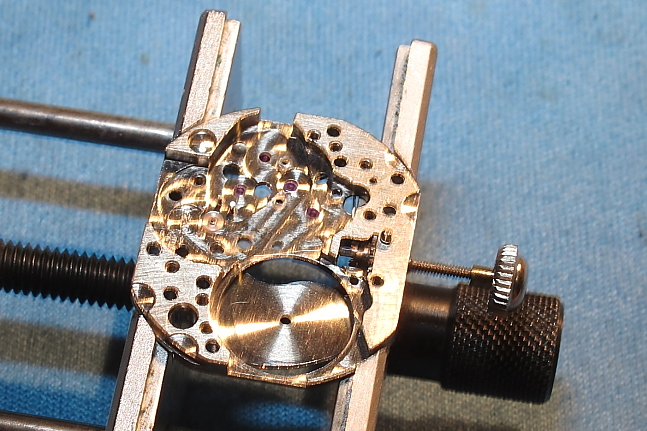 At this point I like to wind the watch and put some power back into the mainspring. I do that so the watch will start working when I reinstall the balance. If the watch doesn't start working then the balance isn't installed right. When the balance starts turning, everything is lined up and the last screw can be replaced. In this shot you can see the balance happily spinning away... rocking back and forth 5 times every second. I always cross my fingers when I put a watch on my timer. It has the ability to "listen" to the ticking in the watch and will tell me how well it's running. I put this watch on my timer and it started out running about 70 seconds fast per day. After some some tweaking I was able to get it down to 6 seconds fast per day... that's about as good as it gets, as the rate will change slightly as the watch unwinds, etc. Now the dial goes back on, along with the hands. Since this is a water proof watch, I'll put a little silicone lubricant on the case threads and the stem tube to help keep things lubricated and water-resistant. 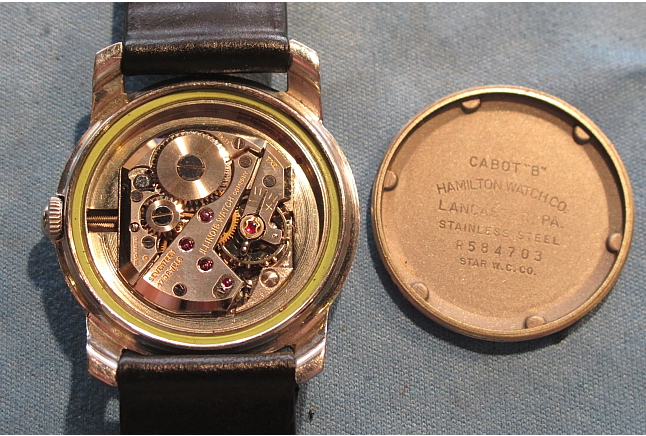 I enter a little "code" to tell me when this watch was serviced and this Cabot B is ready to be closed up. And here it is, all spiffed up, strap reinstalled and even the burn marks look a little better. This Cabot B is ready for another 50 years of faithful service. 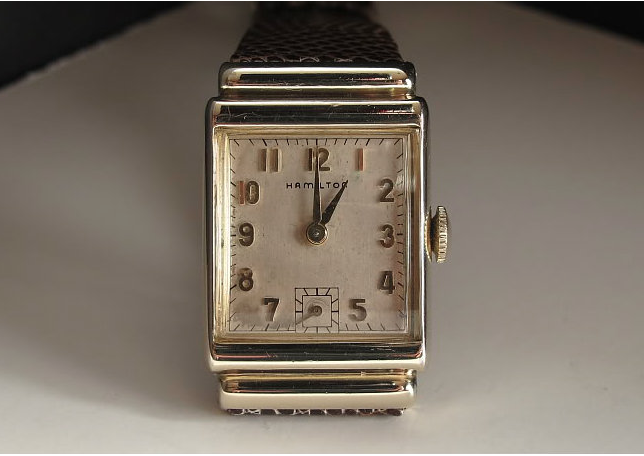 Hamilton introduced a lot of new models in 1948, partly because they also introduced two new 8/0 sized movements to utilize them - the 747 and 748. However, the 14/0 sized movementsdeveloped in the mid 1930's were still very popular and would continue to be used into the 1950's. 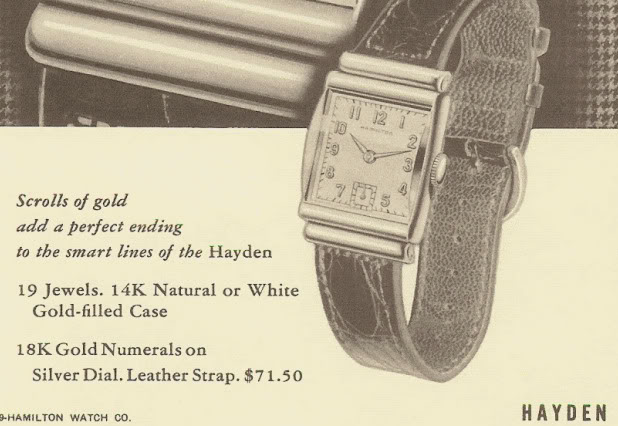 One of the new 14/0 models in 1948 was the Hayden. It would be produced through 1952. 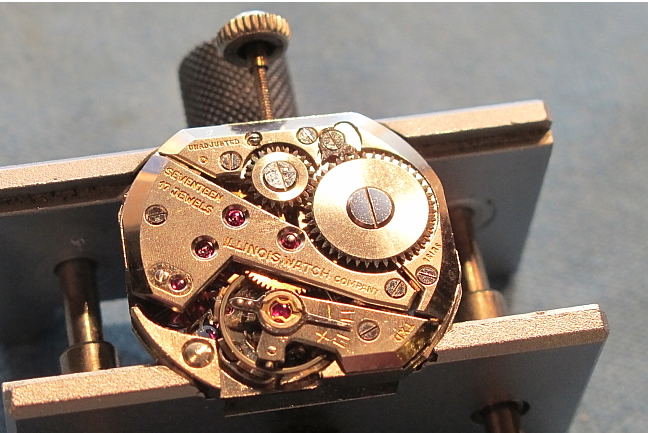 The Hayden featured the 19 jewel 982 movement in a 14k gold filled case. The case is most commonly found in yellow but there are also examples in white gold filled. The white versions are more scarce. The dial is a butler finished silver dial with solid gold numerals and matching hands. 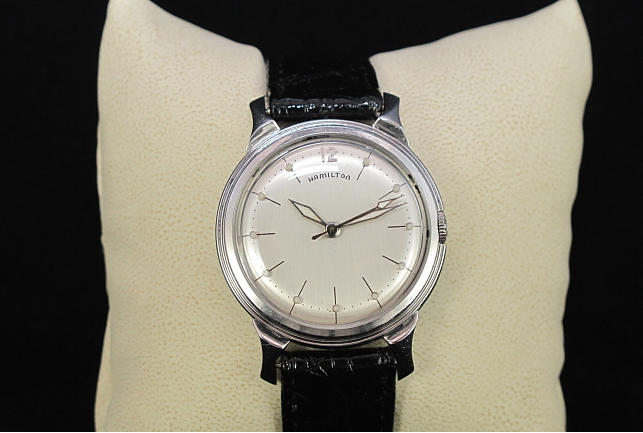 With the white case, the numerals and hands are rhodium plated. 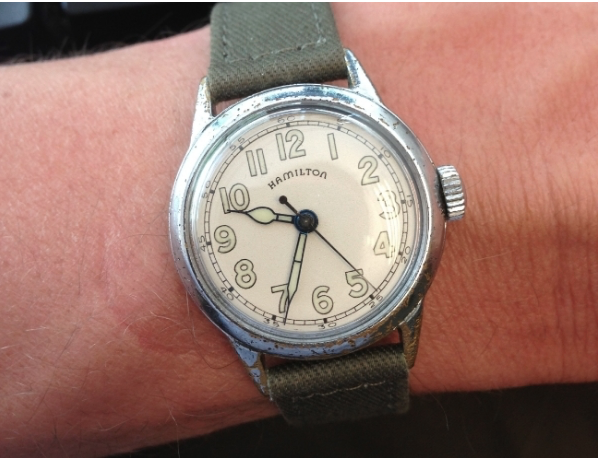 The case is interesting in that it is one of a handful of Hamilton models that featured hidden lugs. 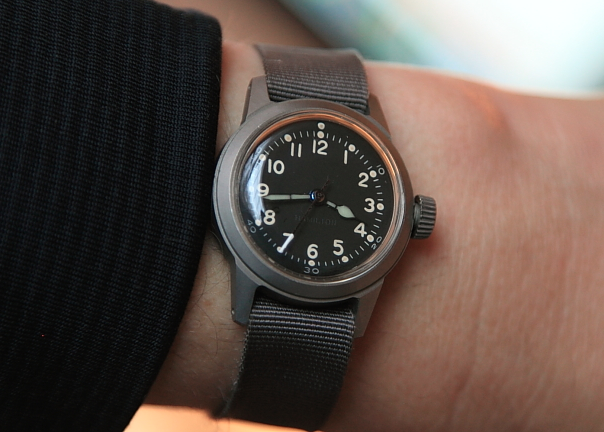 The strap is mounted underneath the bezel, in a hollowed out area. I think the case tends to wear pretty well and is usually in good shape whenever I see one. It could be because of the crystal's thick and curved shape offers some protection. 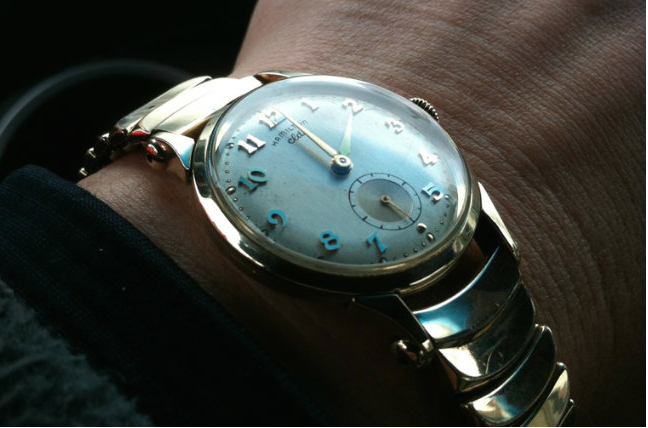 It's a fairly small watch, especially by modern standards, and could easily be worn by a woman today. Here's a couple of shots of a Hayden I've had in my collection for quite some time. 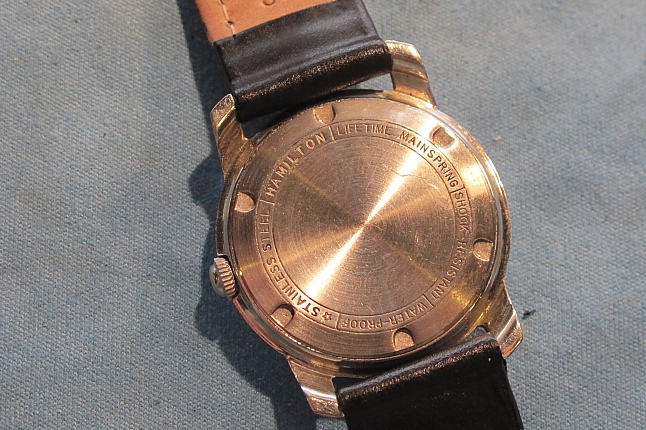 In 1955 Hamilton introduced several watches in the Stormking line. By the end of the 1960's there were 11 different models ranging from the Stormking I to the Stormking XI - but they weren't all available at the same time. 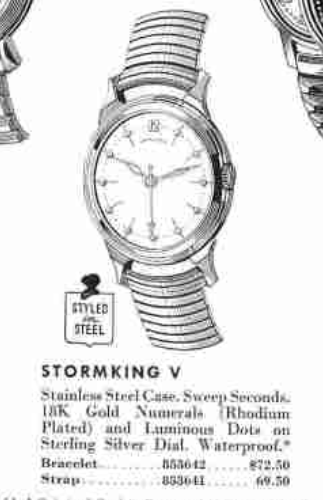 Two models that had a relatively long production run are the Stormking IV and Stormking V. Both of these watches look similar in their catalog drawings but in person there are some obvious differences. First and foremost, the cases are different. The IV has a yellow gold-filled case while the V has a stainless steel case. 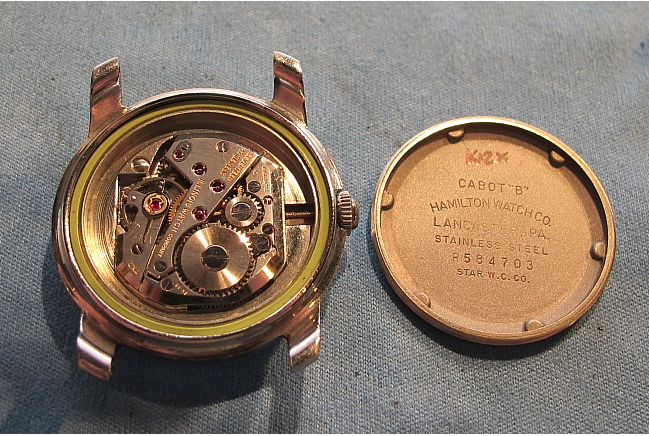 Both watches utilize Hamilton's US-made 8/0 sized sweep second movement; either the 18 jewel 748 or the replacement 18 jewel 735 introduced later on (with shock jewels). Both watches featured butler finished dials with luminous hands and markers / dots. One of the variants of the Stormking IV is a military version. The principle difference in the military version is a special hour wheel so the hour hand moves half as far in 60 minutes - thus turning the 12 hour dial into a 24 hour dial. So, when the little hand is on 6 and the big hand is on 12, it's 12:00 pm. Personally, I would love to obtain a complete Stormking collection but several of the 11 models are solid gold and others are so rare you never seem to see them. Anytime I see a Stormking come up for sale it goes into my watch list. 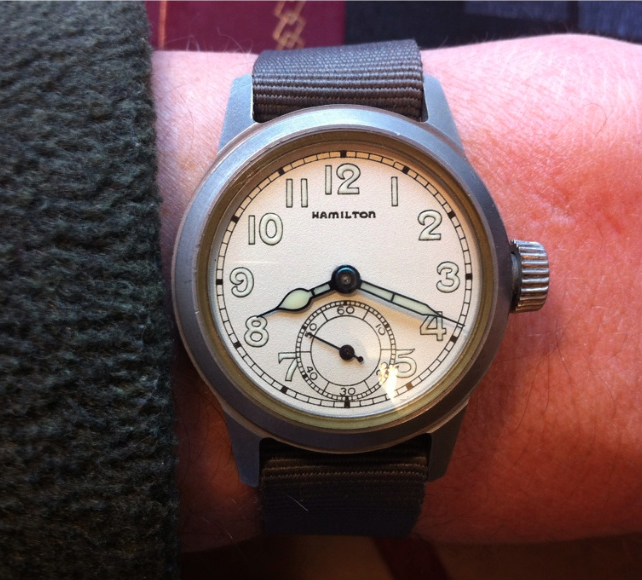 Here's a wrist shot of the Stormking IV. I really like the look of the recessed crown on the side. And here's a photo of a Stormking V I restored for a friend. I wish I took a before shot of it, as it was a real mess. The crystal was scratched up beyond hope and the dial was very dirty. 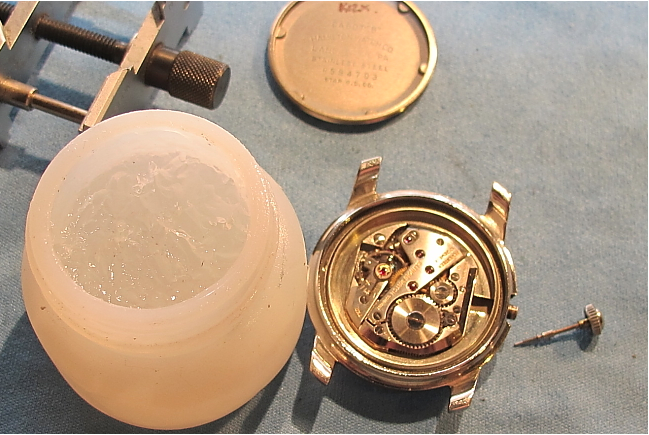 The crystal is an easy fix but the dial needed to be cleaned. It was a refinished dial and the moment it got wet all the printing came off along with all the dirt. It was a nice clean dial with no printing! So I got it refinished again. I think it turned out great. I also relumed the hands, including the second hand. This watch looks really cool in the dark with the hands glowing and all the hour markers too. One of the interesting things about these Stormking models is they have two sets of spring pin holes in the lugs. In other words, the strap (or bracelet) can be mounted in two different places within the lugs. I'm not sure what that's all about, but it's an interesting bit of Stormking trivia. 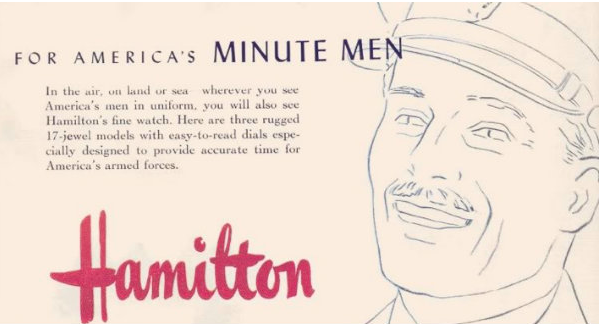 From 1942 to 1946, Hamilton's production was dedicated to the war effort. 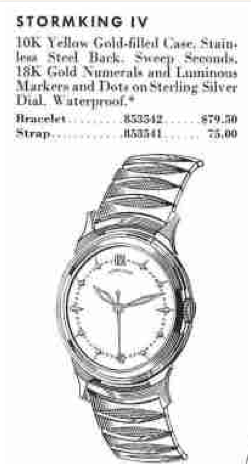 Watches and time keeping devices of all sorts were produced for the US Government and our allies. 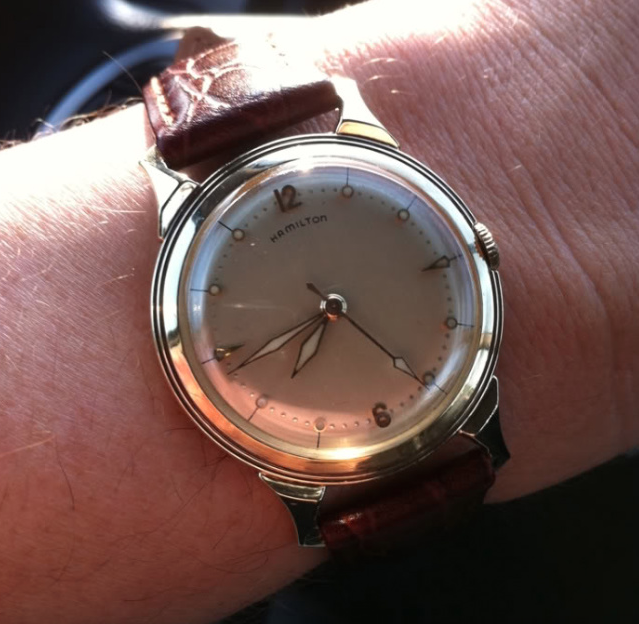 I posted earlier this month an example of a Model 22 Marine Chronometer... a 36 size watch that served aboard ships as the official time keeper. 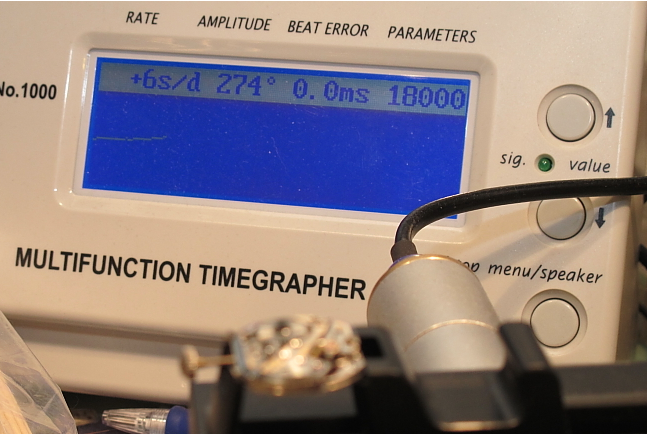 Hamilton also made "bomb timers" that used the 14/0 980 movement in a special case with a hack function. These timers were installed in planes and were used by bombardiers to synchronize bombing runs and effectively hammer their targets. Some collectors have converted these cases to accommodate a strap although they're technically not wrist watches. 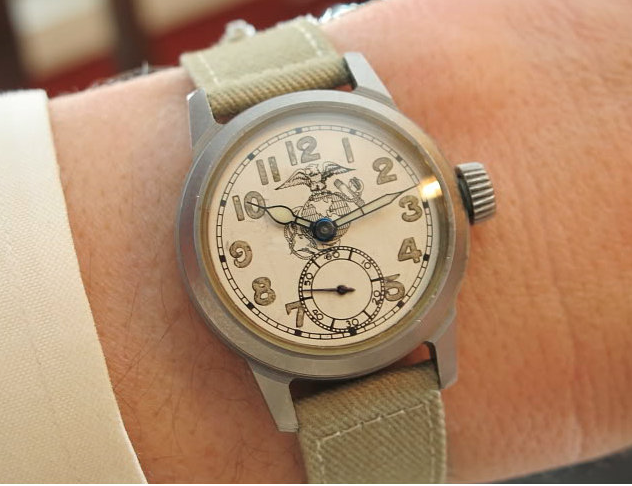 Military personnel also were issued time pieces when they went "into harms way". Initially cases were made by three manufacturers - Wadsworth, Star and Keystone. Some cases had screw on backs and some had a pop-on back (called a tea cup case). Early cases were chrome plated and were prone to extensive wear. They were eventually replaced by a parkerized case with thicker lugs. These cases were used during the Korean war too - but with the 8/0 size 747 movement. Parkerization is a special coating often used in guns as an alternative to bluing. Early cases were engraved on the back with "Ord Dept USA" and a serial number starting with OD - representing a non-waterproof case with 15-17 jewels. The Navy cases were marked differently on the back. A letter was stamped between the lugs representing the case maker... H, W, or S. H and W are Wadsworth cases and S was for Star Watch Case company. 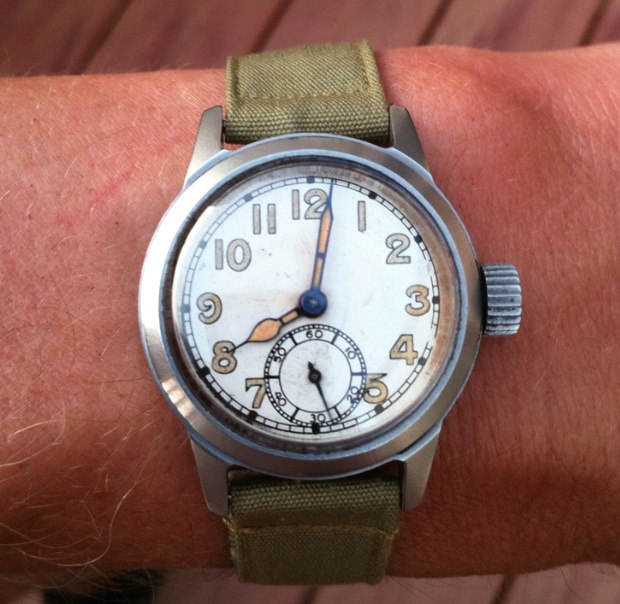 As far as I know, Navy watches used Wadsworth cases, while the other services used both manufactures. Here are some examples that I've acquired. I don't have a complete collection though, so this isn't an exhaustive list. First off are some wrist watches. 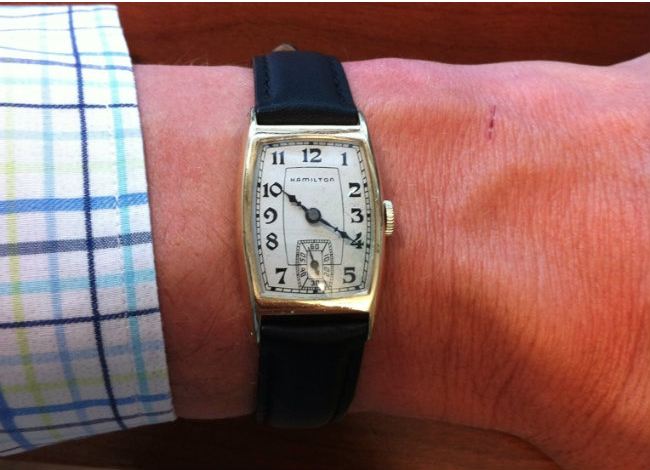 Generally speaking, black dialed wrist watches were used by the Navy. The back of the case will be engraved "USN BUSHIPS". 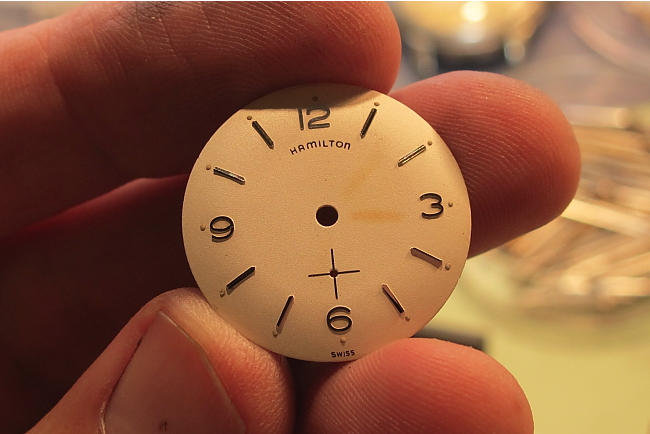 The dial will also have Hamilton embossed in black on the dial - albeit hard to see. 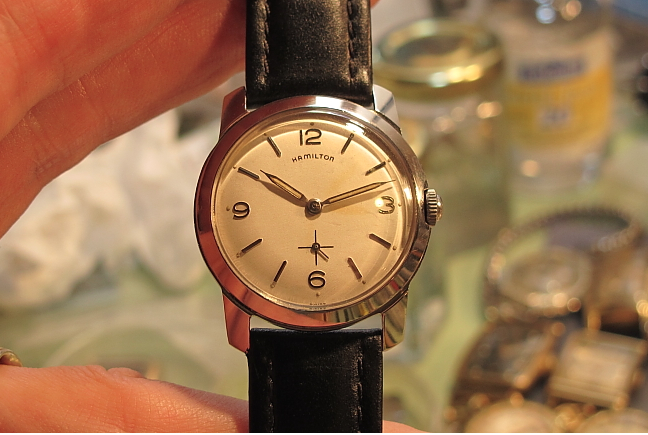 A watch like this one with the sub second hand at 6 will feature a 17 jewel 987A movement. The case will have a screw-on back cover, with a movement ring and dust cover inside, along with a gasket. 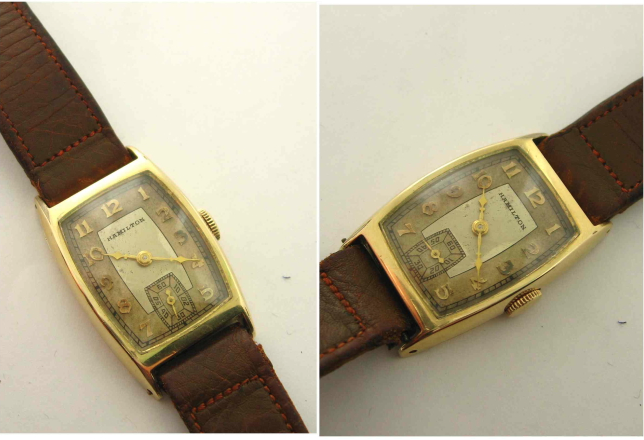 A sweep second hand watch was also available. Depending on the watch it will have a 17 jewel 987S movement inside, or it could have an 18 jewel 2987 in specific naval aviator watches. In this shot the white-tipped second hand is directly over the 7 so it's hard to see it. 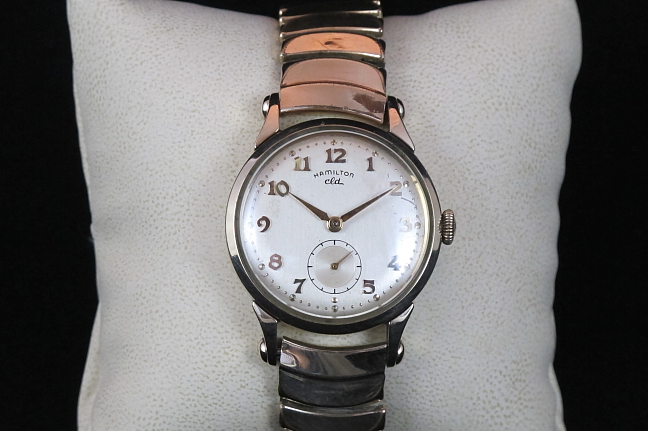 This watch is in a parkerized case, introduced at the end of the war (or slightly after) to replace the chrome plated cases that suffered a lot of wear. This sweep second hand version is in it's correct WWII Wadsworth case. 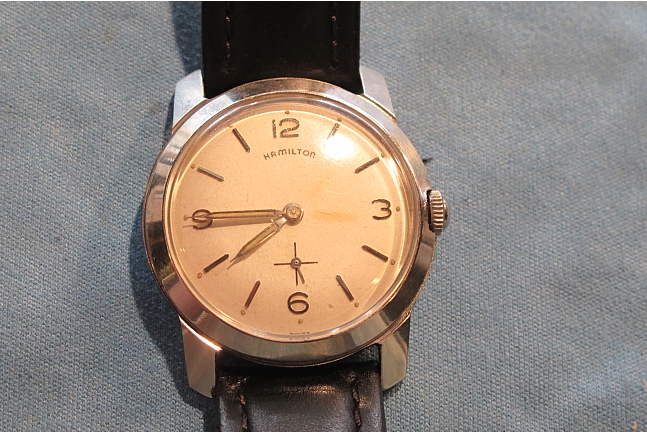 The Army and Marines used white dials and watches would use 987A movements with the sub second hand. Here's a couple of examples that I have assembled using NOS cases with refinished dials. I think they really turned out nice. I've also seen (and purchased) military branch-specific dials. I don't think they were issued for general use but may have been options for personnel in military exchanges and PX's. 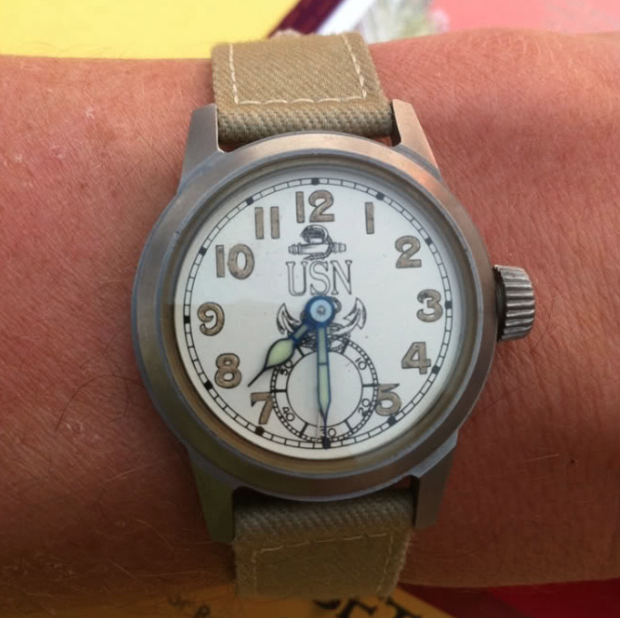 Here's an example of US Navy and Marine Corps watches I've assembled and given to buddies I've known in the service. 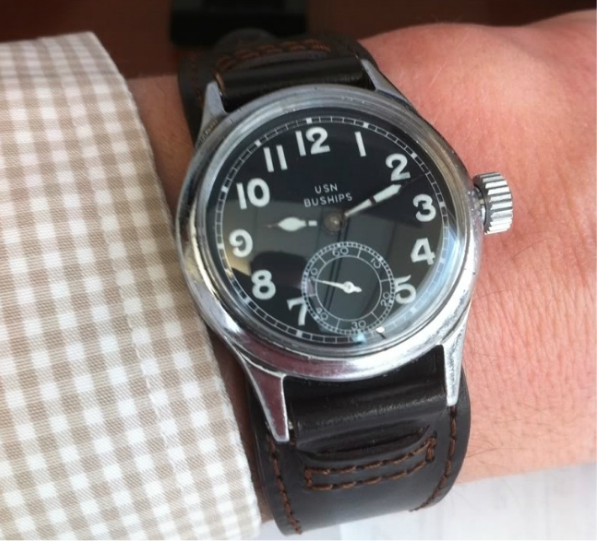 Of course, military watches aren't limited to wrist watches. 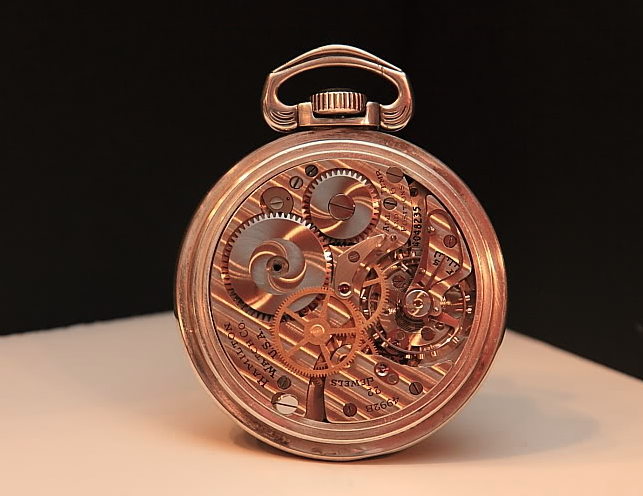 Pocket watches were also produced using the 21 jewel 992B movement as well as the 22 jewel 4992B with a sweep second. Here's an example of the 22 jewel 4992B that my wife's grandfather used during the war while serving in the Pacific as a Naval Flight Officer (Navigator). This watch has a special hour wheel behind the dial so the hour hand moves half as fast and normal - making the dial an 24 hour dial... currently the time is 20:12, or 8:12PM. Of course, the Army got pocket watches too. This one below is interesting as it's a Railway Special but marked US Army on the movement (on the left side at about 8:00). I guess military trains needed to run on time too! If you compare the 992B movement and the 4992B movement you'll see they are very similar. The latter has an extra wheel on the back and a pinion to drive the central sweep second hand. 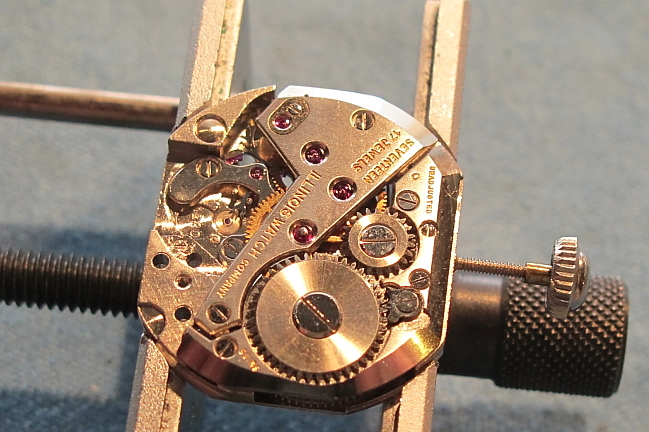 There's a jeweled bridge to hold the second hand shaft and that's the 22nd jewel that makes the 4992B different. Otherwise they are largely the same. If you've got a really good eye for details you'll note the 4992B is missing the mainspring wheel screw... not to worry, it fell out for some reason when I took the picture but I have it.